This is an expert-led live webinar discussing non-adherence to GH therapy, why this is a problem and what interventions can promote adherence for children and their families. Specialists will be presenting and debating on barriers to effective management of growth disorders and which tools are available to implement to improve short- and long-term outcomes. This webinar is suitable for, but not limed to, clinical paediatric endocrinologists, clinical adult endocrinologists, paediatric endocrine nurses, clinical psychologists, and all other healthcare professionals interested in the management of growth disorders. Our team here at King’s College London are very keen to further understand the complex issue of treatment non-adherence in paediatric Growth Hormone Deficiency. The primary aim of recombinant growth hormone treatment during childhood and adolescence is to accelerate linear growth and return the child to the normal growth curve in order for them to attain a ‘normal’ or ‘near-normal’ final adult height. Despite the benefits of growth hormone treatment on long-term health outcomes, evidence has shown that many children with Growth Hormone Deficiency still in fact, fail to achieve their target genetic adult height. This has been largely attributed to what is termed ‘treatment non-adherence’. As growth hormone is administered via a daily subcutaneous injection, treatment non-adherence can take many forms, from taking a smaller dose than prescribed, missing an occasional dose, to taking few or no doses at all. To develop our understanding, we wish to gain a better insight into the views and experiences of parents/caregivers with regards to their child’s condition and treatment, via two studies which form part of a wider PhD project. We are interested in involving parents/caregivers of children 12 years of age and under, who have been diagnosed with Growth Hormone Deficiency and have been prescribed growth hormone treatment. Parents/Caregivers of patients are eligible if they are responsible for either administering or supervising their child’s growth hormone injection on a daily basis. All eligible parents/guardians have the option to participate in either the first or second study independently, or to participate in both studies. Taking part in the first study will involve filling out a 10-15 minute questionnaire via a URL address link sent by the King’s College London research team. If preferred, a paper copy with a self-addressed envelope can be posted instead. The second study involves taking part in a 30-40 minute interview, which can be completed either via telephone or face-to-face, at your earliest convenience. The information collected from both studies will enable us to develop new ways of supporting the use of prescribed growth hormone treatment within endocrine clinical practice. Our findings will further help health care professionals to better support patients with growth hormone deficiencies and their families to get the best results from their prescribed treatment and self-manage their long-term condition effectively. For the past year, we have been conducting a study to investigate behavioural characteristics observed in SRS. The study involved a play session/semi-structured interview which was used to observe how children play with different toys, their ability to tell stories and how they communicated with the researcher. For older children and adults, this was an informal conversation to find out about things such as friendships, hobbies and school/work. The study also involved completing a few different activities to assess skills such as language, memory and problem solving. We finished visiting families in October 2018 and in total, we saw 15 individuals with an mUPD7 diagnosis and 18 individuals with an 11p15 diagnosis. This was slightly more than our original target so we are extremely grateful to all of the families who took part in the study and made it possible. The findings from the study have been written for publication in a scientific journal and as soon as the article is published, we will share this with the CGF. Below is a summary of the main findings from the study. Autistic behaviours are broadly defined as having difficulty with social interaction and social communication, as well as displaying restricted interests and repetitive behaviours. Previous research has indicated that autistic traits may be more common in SRS than in the general population. In particular, it has been suggested that individuals with an mUPD7 diagnosis are more likely to display autistic traits, with some also having a diagnosis of an autism spectrum disorder (ASD). Although this research has indicated that autistic traits are common in SRS, the nature of these behaviours has not been assessed in a systematic way, using standardised measures. Therefore, the aim of our research was to use both a gold-standard behavioural assessment and a questionnaire, completed by a parent/caregiver, to identify autistic traits associated with SRS 11p15 and SRS mUPD7. A further aim of the study was to assess cognitive abilities associated with SRS 11p15 and SRS mUPD7. Autistic traits were assessed using the Social Responsiveness Scale, second edition (SRS-2) and the Autism Diagnostic Observation Schedule, second edition (ADOS-2). Cognitive abilities were assessed using the British Ability Scales, third edition (BAS3). Participants in the 11p15 group ranged in age from 4 – 15 years and in the mUPD7 group, participants ranged in age from 8 – 28 years. In relation to autistic traits, the findings from the questionnaire (SRS-2) indicated that 53% of the mUPD7 participants and 45% of the 11p15 participants were reported by their family member as having some difficulty with social skills and restricted interests/repetitive behaviours in daily contexts. The level of difficulty with these behaviours varied between the groups, with 38% of the mUPD7 participants reported as having significant difficulty with these behaviours, compared with 11% of the 11p15 participants. Furthermore, the level of difficulty with social skills did not differ between the groups but the mUPD7 group were reported as displaying more difficulty with restricted interests/repetitive behaviours. Overall, this suggests that autistic traits are more common in both SRS mUPD7 and SRS 11p15 than in the general population but that these traits seems to be more pronounced in SRS mUPD7. In particular, these individuals may struggle with restricted interests and repetitive behaviours. Autistic traits were also assessed using an in-person assessment (ADOS-2). The ADOS-2 provides an opportunity to observe whether an individual displays difficulty with social skills and restricted interests/repetitive behaviours in a semi-structured context. The findings from this assessment supported the findings from the SRS-2, with 33% of the mUPD7 group and 11% of the 11p15 group displaying autistic behaviours during the assessment. Once again, this indicates that individuals with an mUPD7 diagnosis are more likely to have difficulty with autistic behaviours. It is important to note that in both groups, a number of individuals did not display these behaviours. Therefore, clinicians should be aware of this increased likelihood of ASD in SRS but consider on an individual basis, whether a full assessment for ASD would be appropriate. Cognitive abilities were also assessed in order to identify the overall ability of individuals with SRS and whether individuals show consistent strengths and difficulties with specific aspects of learning. Each participant completed several different activities which provided a general conceptual ability (GCA) score. This is equivalent to an IQ score and in the general population, a score of 100 is average. In the 11p15 group, the average GCA score was 99, with scores ranging from 62 (below average) to 140 (above average). This distribution of scores is typical of the general population, indicating that learning is not affected in individuals with SRS 11p15. In the mUPD7 group, the average GCA score was 80, with scores ranging from 57 (below average) to 91 (average). The average score for this group is lower than the general population and the majority of participants had scores in the borderline range. This means that although they do not have intellectual disability, their scores tended to be slightly below average. This indicates that individuals with mUPD7 may have more difficulty with learning than their peers and that additional support in school may be beneficial. Once again, this should be considered on an individual basis. In both groups, there was no evidence of consistent strengths and difficulties between individuals, in relation to the cognitive abilities that were assessed. In summary, the findings from this study indicate that some individuals with SRS have difficulty with autistic traits and these tend to be more common in individuals with SRS mUPD7. It is important for families and clinicians to be aware of this increased likelihood of ASD as, in some cases, a full assessment for ASD may be appropriate. In addition, individuals with SRS mUPD7 may be more likely to have difficulty with learning, compared to their peers so it is important to consider whether additional support with learning and development may be useful. It is important to note that there was variability within each group, indicating that some individuals may have more difficulty with autistic traits or learning than others. Therefore, a referral for additional support or services may be beneficial for some individuals with SRS but not required for others. Sotos syndrome is a congenital overgrowth syndrome associated with intellectual disability. Previous research has reported that individuals with Sotos syndrome often have communication impairments and delayed language development. However, the nature of these difficulties has not been explored in detail. Language and communication skills are fundamental for human interaction. Effective communication can facilitate learning and enable individuals to share information and ideas so it is important to identify the extent to which children with Sotos syndrome struggle with language and communication, as difficulties may impact upon learning and social development. Two important communicative abilities are language structure and pragmatic language. Language structure refers to understanding the rules governing language, such as the ability to construct coherent sentences in which words are used in the correct order. Pragmatic language involves understanding how to use language appropriately, such as using language that is appropriate to the context. Some individuals may have better language structure skills or pragmatic language skills, so difficulty with one does not necessarily mean that an individual will also struggle with the other. To date, these communication skills have not been investigated in individuals with Sotos syndrome. So, the aim of our research was to establish whether children with Sotos syndrome have difficulty with these skills and if so, whether particular aspects of language and communication are more problematic than others. Our study included 31 children with a diagnosis of Sotos syndrome, ranging in age from 4 – 16 years. Communication abilities were assessed using a questionnaire (The Children’s Communication Checklist, second edition (CCC-2)), which was completed by the parent or caregiver of each child. The CCC-2 has 70 questions which are designed to assess a range of communication abilities, including both language structure skills and pragmatic language skills, as well as social relations and restricted interests. In terms of overall communication skills, we found that the majority of children with Sotos syndrome were reported by their parent or caregiver as having difficulties with language and communication. This was defined as having greater difficulty with language and communication than typically developing peers of the same age (children the same age with no diagnosed conditions). There was no difference between overall language structure skills and overall pragmatic language skills, indicating that children with Sotos syndrome have similar difficulty with both of these aspects of language and communication. Furthermore, the findings identified that language structure skills predict pragmatic language skills, meaning that better language structure skills result in better pragmatic language skills for children with Sotos syndrome. Four specific language structure skills (speech, syntax, semantics and coherence) were compared in order to see whether children with Sotos syndrome had particular difficulty with any of these specific skills. The findings indicated that the participants were reported as having a similar degree of difficulty with all of the skills. Comparisons were also made between the four specific pragmatic language skills (inappropriate initiation, stereotyped language, use of context and nonverbal communication). The findings identified that children with Sotos syndrome were reported as having greater difficulty with use of context and nonverbal communication, compared with inappropriate initiation and stereotyped language. Furthermore, participants were reported as having particular difficulty with social relations. Overall, the findings from this research demonstrate that the majority of children with Sotos syndrome struggle with language and communication skills and will therefore require support with the development of these skills. In particular, children with Sotos syndrome have difficulty with the consistency of communication across different situations, with understanding and using nonverbal communication, such as eye contact, gestures and facial expressions and with forming and maintaining relationships with peers. Lane, C., Van Herwegen, J. & Freeth, M. (in press). Parent-reported communication abilities of children with Sotos syndrome: Evidence from the Children’s Communication Checklist-2. IMAGINE ID is a research study that aims to increase understanding of children and young people with intellectual disability. It is supported by UNIQUE, the rare chromosome disorder charity. 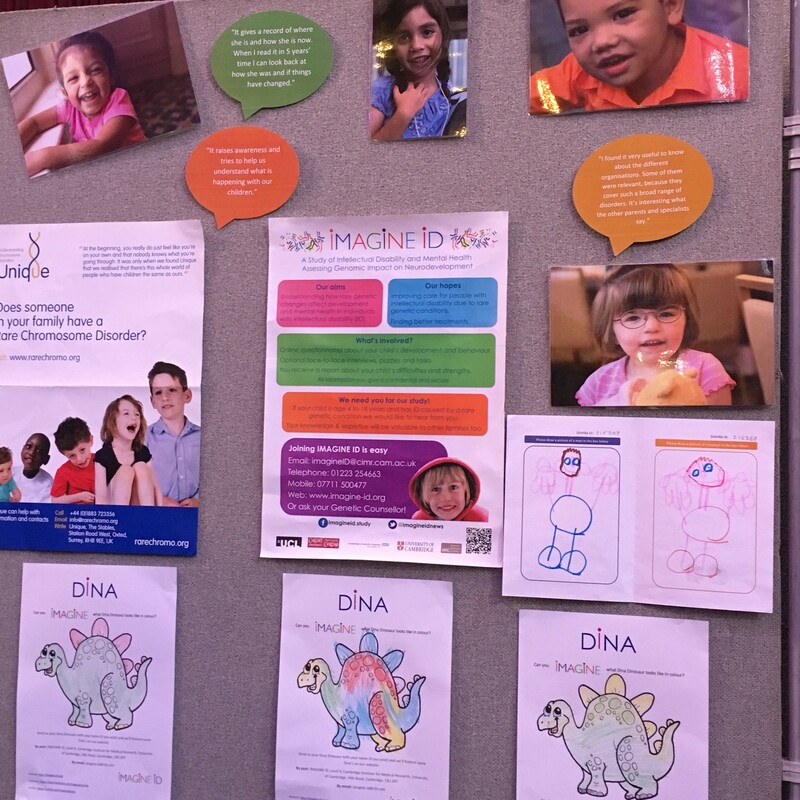 The IMAGINE ID team is very keen to learn more about the link between behaviour and rare chromosome conditions. The study, led by University of Cambridge, University College London and Cardiff University, hopes to collect information from over 3,000 families by May 2019. To participate in IMAGINE ID your child should be aged 4 or over. The research group is based in the UK but they are interested in families worldwide. If you live outside the UK, to take part you must have access to your child’s genetics reports. Taking part involves filling out secure online questionnaires about your child’s development and behaviour from the comfort of your own home. If you’re not happy with computers or do not have access to the internet, the IMAGINE ID team can go through the questionnaire with you over the telephone or in person. The questionnaires will take approximately 2-3 hours, but you are able to save your answers as you go and can login an unlimited number of times to complete it. After completing this you will receive a personalised summary report which you may find useful when your child is undergoing assessment for services, school or specialist treatment. If you wish, members of the IMAGINE ID team may also visit you at home to conduct an interview with you and puzzles with your child. 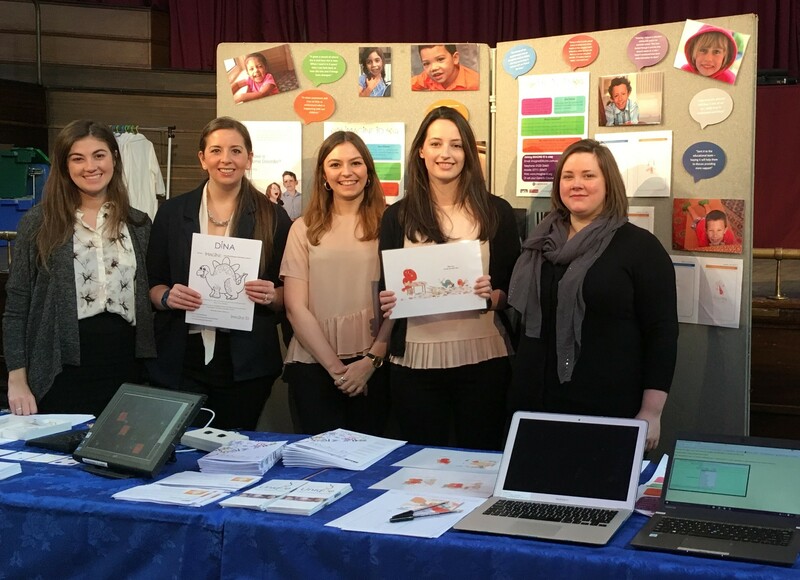 If you are interested and want to find out more about the IMAGINE ID study please contact them by telephone on +44 (0)1223 254 631 or email them at imagine.id@nhs.net The team is very happy to answer any questions you have.